1. Symptoms - (1) GERD로 오인될 수 있습니다. (2) High index of suspicion이 필요합니다. 1. 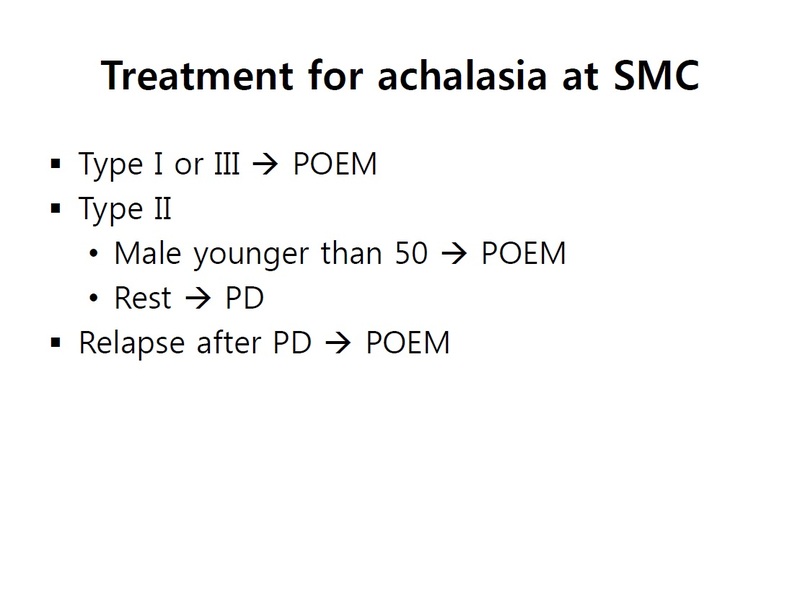 Achalasia 의 증상 - (1) GERD로 오인될 수 있습니다. (2) High index of suspicion이 필요합니다. 술자리에서 큰 배움을 얻기도 합니다. 2014년 12월 5일 대한상부위장관헬리코박터 추계학술대회 후 저녁식사를 하면서 한 교수님과 이런 저런 이야기를 나누었습니다. 물론 분위기를 위하여 약간의 술도 빠질 수 없었지요. 선생님께서는 최근에 경험한 교훈적인 증례를 소개해 주셨습니다. 선생님은 "achalasia가 GERD로 오인될 수 있다"는 점을 강조하셨습니다. 한 병원에서 오랜 기간 refractory GERD로 진단으로 매우 많은 검사와 장기간의 치료를 받았지만 호전이 없었던 환자였습니다. 우연히 esophagography를 찍었는데 전형적인 bird beak의 achalasia 소견이 발견되었습니다. 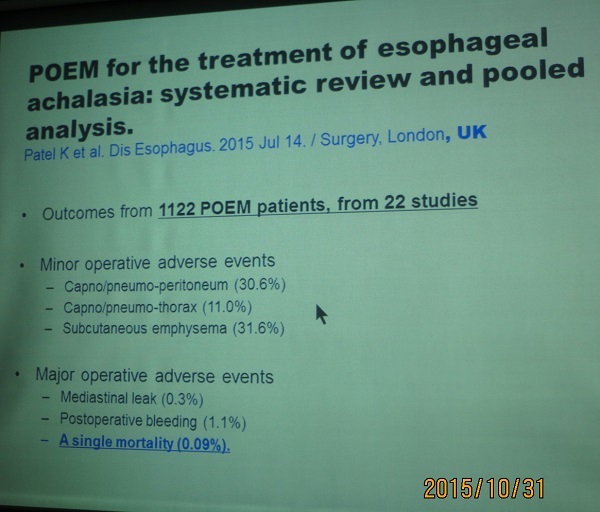 환자는 dysphagia를 호소하지 않았는데도 esophagography는 전형적인 achalasia 소견이었습니다. 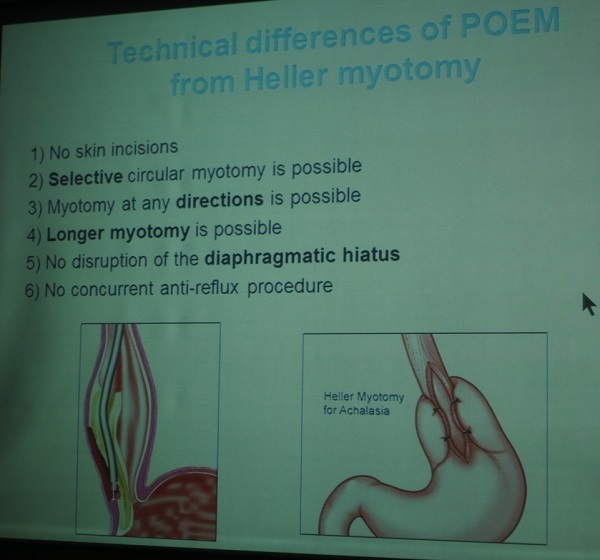 POEM(peroral endoscopic myotomy)으로 치료하였고 refractory GERD로 오인되었던 증상이 완벽히 좋아졌습니다. 원래 dysphagia를 호소하지 않았던 환자가 POEM을 받고 난 후 자신의 과거 증상이 dysphagia였음을 뒤늦게 깨달았다고 합니다.^^ "아~~~ 음식이 이렇게 쉽게 넘어갈 수도 있군요..."
전공의들이 많이 보는 UpToDate에 이런 언급이 있습니다. 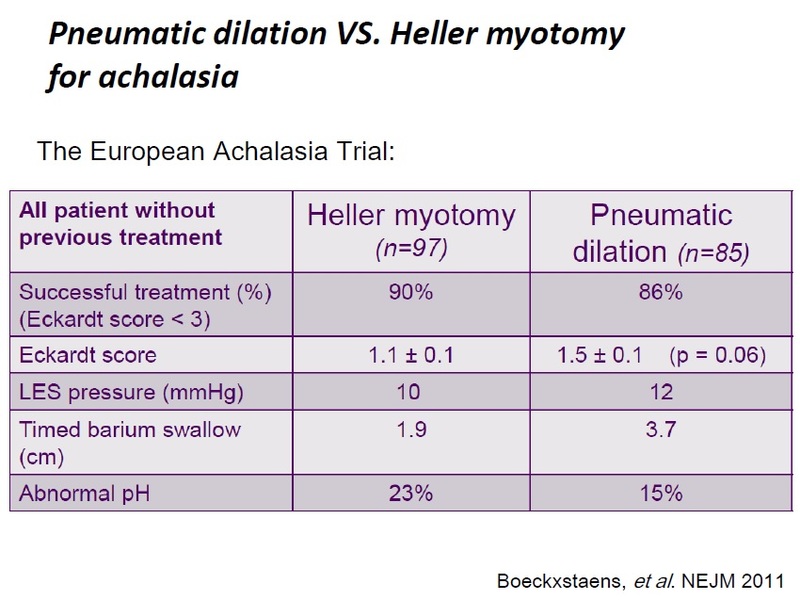 With the increasing availability of manometry, patients with achalasia are often referred at an early stage when they lack the classic features of established disease. 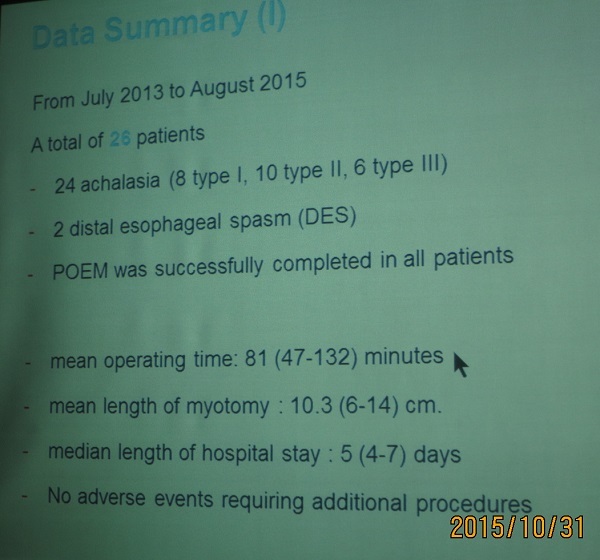 A prospective five year study of the presenting features of untreated achalasia referred to our department was undertaken. Twenty men and 18 women presented throughout adult life, with a mean age at the time of diagnosis of 44 years (range 17 to 76 years). 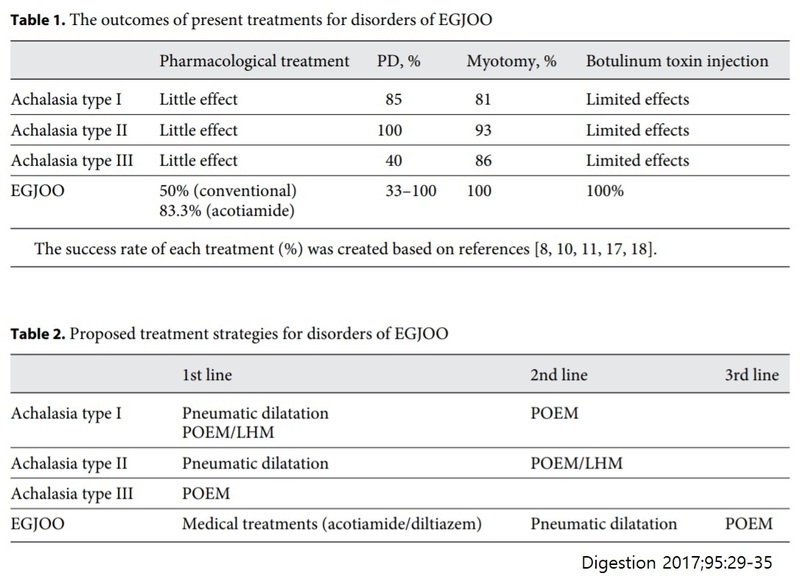 The presenting symptoms were dysphagia: for solids (100%) and for liquids (97%), chest pain (74%), and weight loss (60%). 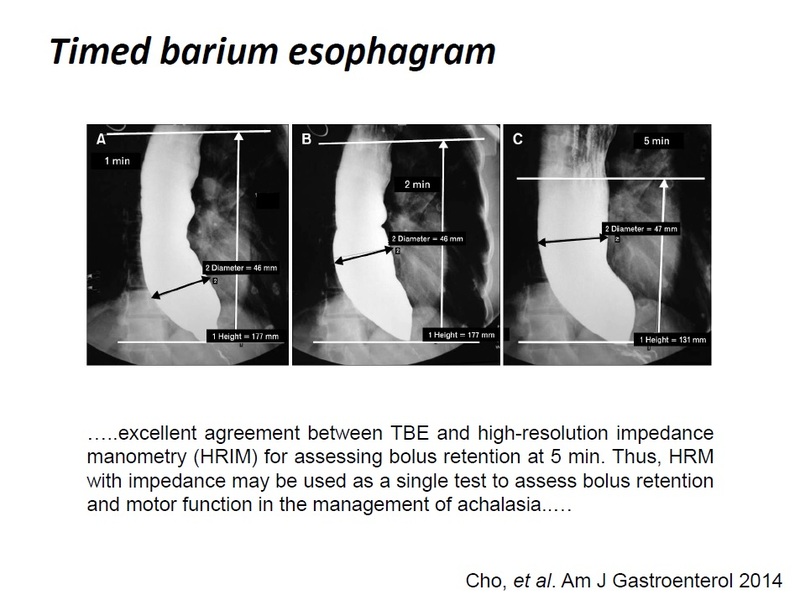 Endoscopy was reported as normal in 15 patients and achalasia was suggested in only 21 of 33 barium examinations. Fourteen had been treated for gastrooesophageal reflux but none had been misdiagnosed as having cardiac or psychiatric disease. The annual incidence of achalasia in the Lothian region is 0.8/100,000 of population. Persistent dysphagia is the cardinal symptom of achalasia which presents throughout adult life. 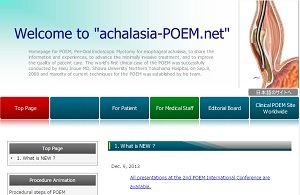 Nevertheless, recent onset achalasia is often misdiagnosed as gastrooesophageal reflux disease. Because endoscopy is frequently normal and the diagnosis is often not made by radiology, manometric investigation is necessary if the condition is to be recognised and treated at an early stage. 제가 refractory GERD에 대한 강의에서 많이 사용하는 표입니다. Motility disease가 중요하게 언급하고 있습니다. 특히 achalasia가 refractory GERD의 감별진단에 들어간다는 점이 중요합니다. GERD에 의한 역류와 achalasia에 의한 역류는 조금 다릅니다. Achalasia의 경우 환자 스스로는 다 먹었다고 생각하지만 늘어난 식도에 음식이 정체된 상태입니다. 환자가 밤에 누우면 물에 빠진 것 같은 느낌의 역류가 발생합니다. 물론 심한 achalasia의 경우이지만. 전형적인 achalasia로 POEM 치료를 받은 여자 환자입니다. 그런데 과거력을 보면 역류성 식도염으로 진단받고 치료받은 병력이 있었습니다. 물론 효과는 없었겠지요. Achalasia의 진단에는 여러 방법이 가능합니다. 내시경에서 의심될 수도 있고 복잡한 운동기능검사를 할 수 있습니다. 그러나 esophagography가 쉽고 직관적이고 강력합니다. 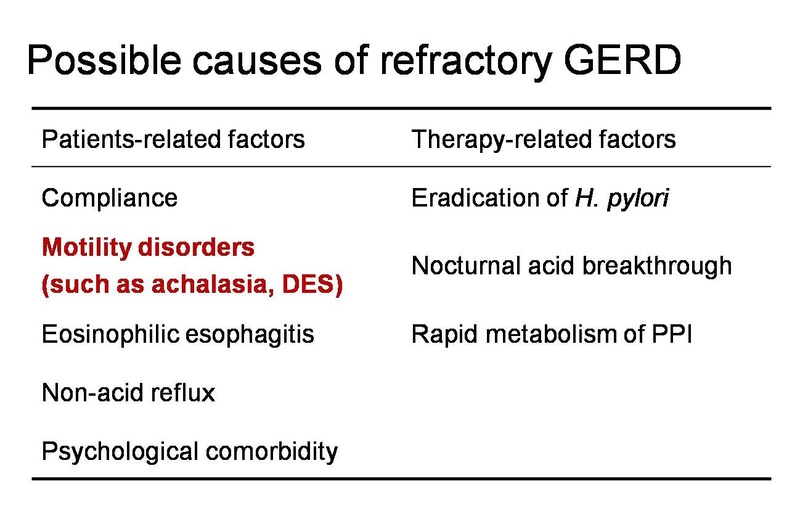 Refractory GERD 환자에서 achalasia를 배제하기 위하여 esophagography를 해보면 어떨까요? Fancy하고 힘든 검사에 앞서 오래되고 투박하지만 여전히 유용한 esophagography를 ��합니다. 심한 achalasia의 내시경 소견은 분명 정상이 아닙니다. Hiatal opening이 좁고 tight 해 보이고 그 상방의 식도는 변형된 모습으로 늘어나 있습니다. Chest CT 찍다가 우연히 발견. 자세히 문진해보니 dysphagia가 오래 전부터 있었다고 함. 음식물을 상당부분 제거한 후 내시경을 하였을 때 여전히 식도에 음식물이 남아있고 식도가 매우 확장되어 있으며 GE junction은 약간 tight하였음. 지속적인 위액 역류로 내원하신 분입니다. GE juction 통과에 그리 저항감은 없었으나 느낌상~~ 식도체부가 넓어져 있는 양상이며 식도에 가소콜 등의 액체가 남아 있었습니다. R/O achalasia로 의뢰하였고 최종적으로 achalasia로 나와 POEM 예정인 것으로 알고 있습니다. 5년간 언친 증세가 있었고 점차 체중이 빠졌던 분입니다. 과거 내시경 후 역류성 식도염으로 들은 바 있다고 합니다. 그러나, 내시경 사진을 자세히 보면 EG junction이 tight 하고 하부식도가 늘어난 모양입니다. 식도 증상이 있는 사람에서 이 정도 소견이 보이면 achalasia를 의심할 수 있어야 합니다. 일본 나가사끼 대학의 Minami 등의 2015년 논문에서 옮깁니다 (Minami. PLos One. 2015)). Minami 등은 과거부터 알려진 식도이완불능증의 내시경 소견을 재평가하면서 "Pinstripe Pattern"이라고 명명한 '가늘고 긴 longitudinal longitudinal wrinkcle'을 소개하였습니다. POEM을 하면 pinstripe pattern이 없어진다고 합니다. Pinstripe pattern의 kappa 값은 0.61로 food/liquid remnant 소견의 0.69 와 비슷했습니다. 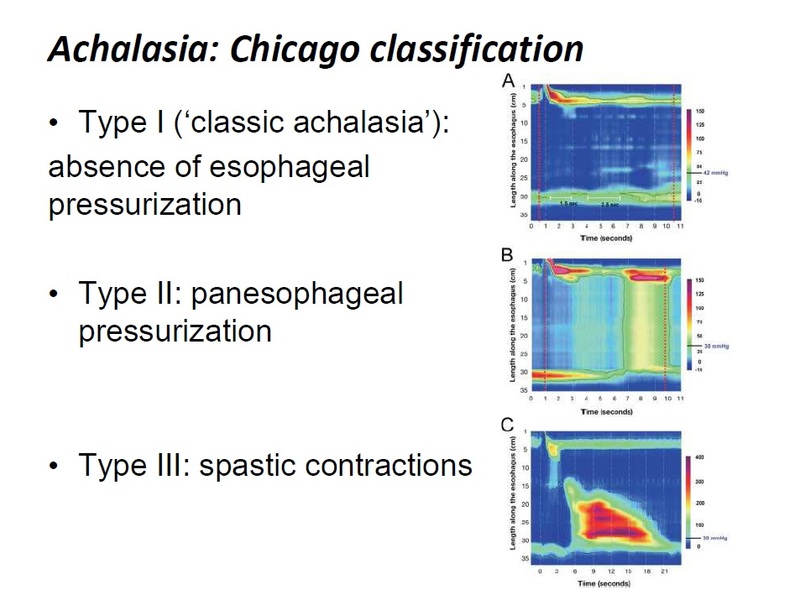 Typical findings of primary esophageal achalasia. (a) Dilation of the esophagus. 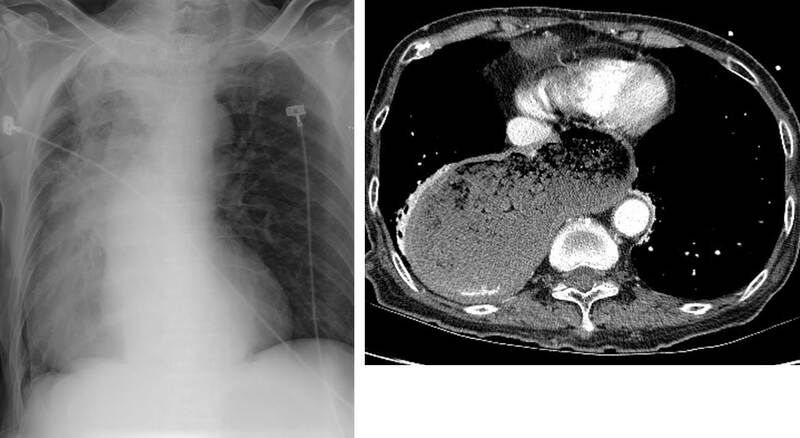 Dilated esophagus drooped to both sides of the spine. 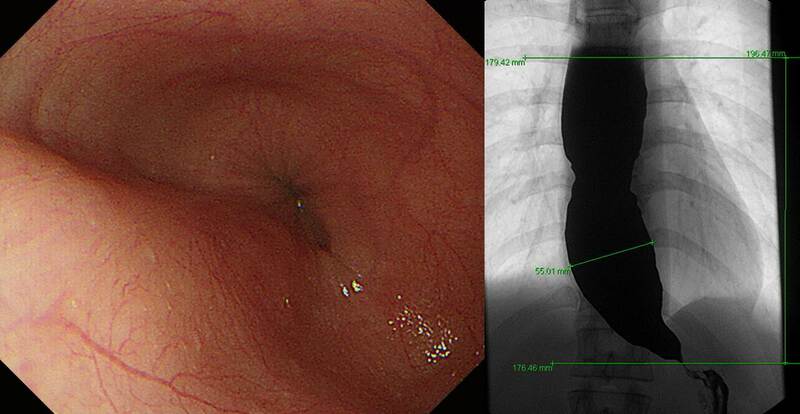 (b) Food remnant in the esophagus. (c) Whitish coating of the mucosa caused by adhesion of the remained food inside of the esophagus and thickening of the mucosa. (d) Functional stenosis of the esophago-gastric junction. Endoscope passes through the tight segment with some resistance. 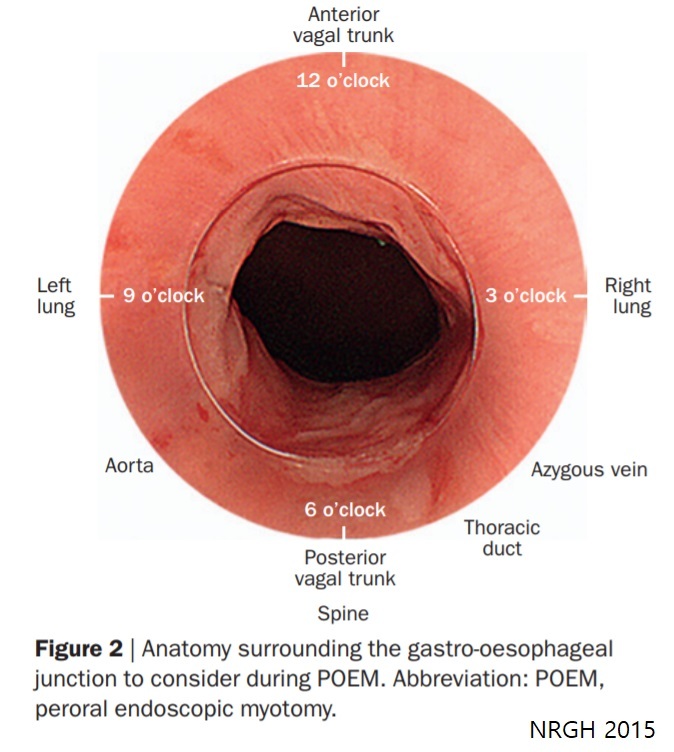 (e) Abnormal contraction of the esophagus. Simultaneous contraction is clearly observed. Pinstripe pattern (PSP). (a) Minute superficial wrinkle was observed on the mucosal surface. (b) Indigocarmine spraying made the superficial structure clearer. (c) Magnifying observation after indigocarmine spraying. Slight gap was observed between each longitudinal line. (d) NBI Image with magnification. The gap observed by magnifying chromoendoscopy was also identified via NBI magnification. Each superficial microvessel was substantially transparent at the gaps between stripes. Showa 대학의 Gomi 등은 Champagne glass sign을 제안하였습니다 (Gomi K. Digest Endosc 2016). 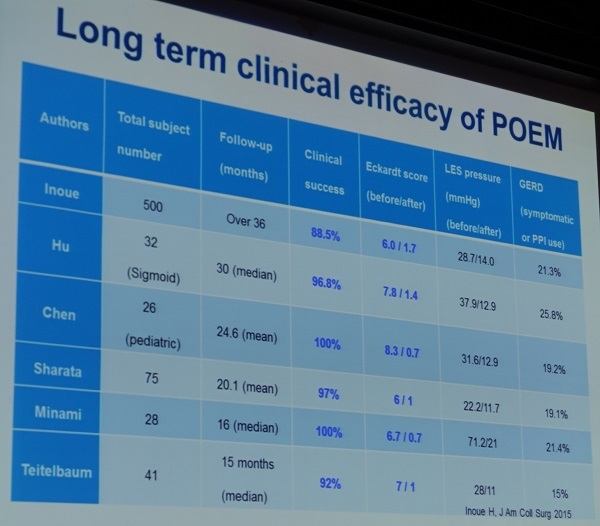 "CG-0 was seen in 73 patients (28.0%), whereas the CGsign was seen in 186 patients (71.3%), of whom 170 (65.1%) wereCG-1 and 16 (6.1%) were CG-2." Different types of champagne glass (CG) sign. 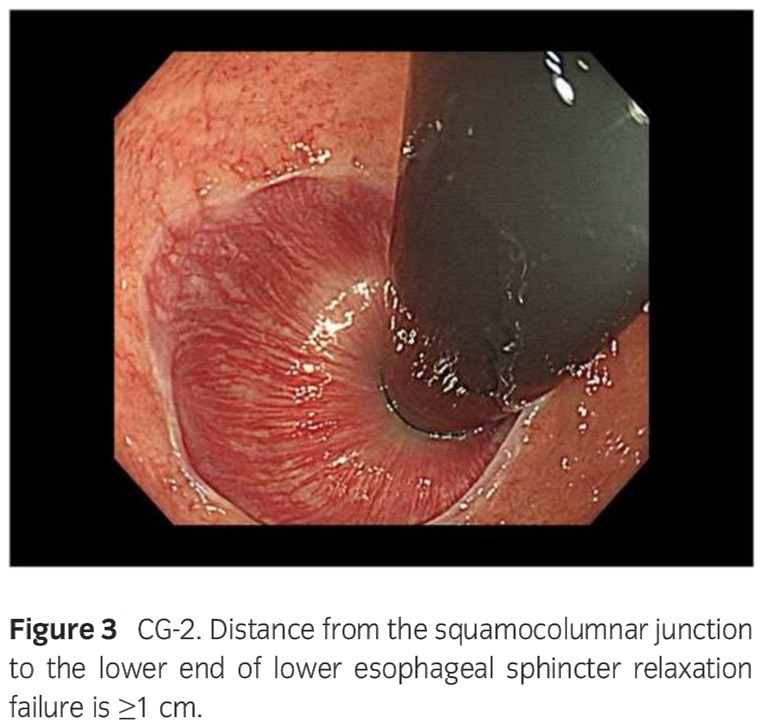 LESRF, lower esophageal sphincter relaxation failure; SCJ, squamocolumnarjunction. Achalasia를 평가하는 fancy한 방법이 많지만 다소 전통적일 수 있는 barium swallow를 약간 변형한 timed barium swallow법이 여전히 유용합니다. Pneumatic dilation과 Heller myotomy를 비교한 아래 연구에서도 주요 결과지표의 하나로 사용되고 있습니다. 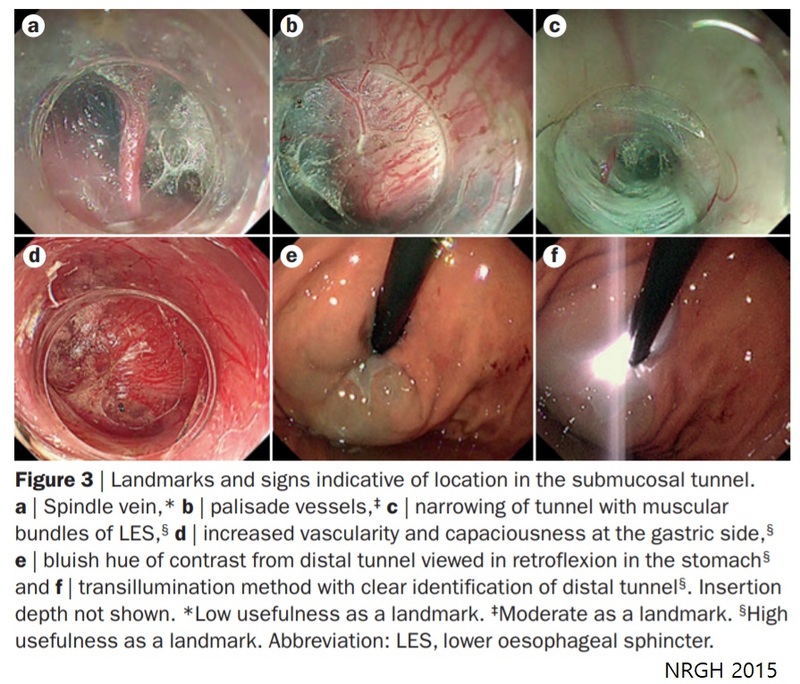 A: Perforating vessels from the outer esophagus to the submucosal vessel; image captured during tunnelization in POEM (bottom side muscle layer, left side submucosal lifting); B: Submucosal drainage vessel (mucosal layer lifted on during ESD). These veins can become esophageal varices in portal hypertension; C: Submucosal vessels connecting the drainage veins to the mucosal branching vessels (in the lamina propria); D: Spindle veins immediately below the GEJ (in left side of the image, in blue, the submucosa and in the right side the muscle); E and F: branching vessels (seen from inside the submucosal tunnel). G: palisade vessels. High magnifying narrow band imaging image of normal esophageal mucosa (luminal side). A: Soft pressure of the endoscope distal attachment (“hood”) onto the mucosal surface demonstrates SECN, hard pressure onto the mucosa compresses horizontal vessels, allowing clear observation of IPCLs; B: In the circle the SECN located at the top layer of lamina propria mucosae, just beneath the epithelium. The black arrows indicate the branching vessels into the lower lamina propria; white arrows indicate the IPCL located in the epithelial papilla, which is a projection of lamina propria mucosae into the epithelium. 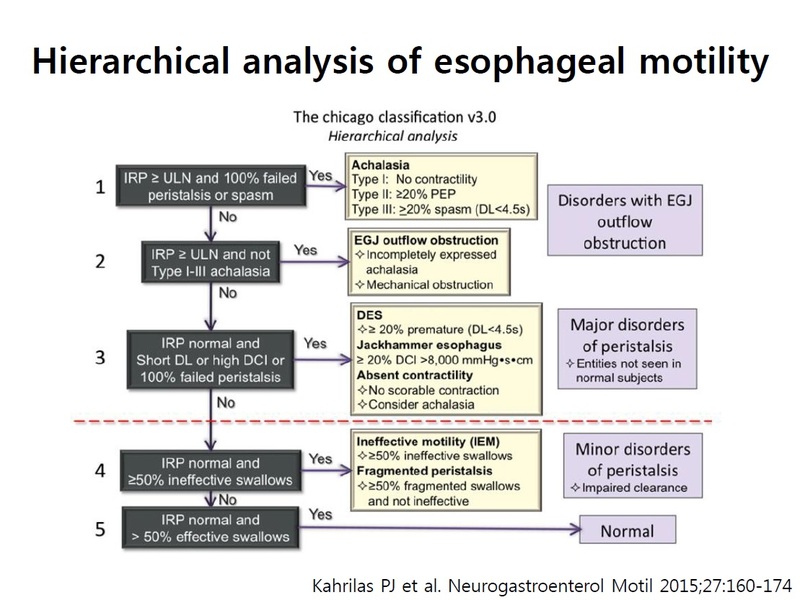 The figure shows the histology of a non-pathologic esophageal specimen. The vessels’ wall has been colored by CD34, showing superficially the IPCLs (upper part of the lamina propria, arising the epithelium) and the SECN; deeply in the lamina propria the branching vessels. In the sumucosal layer also the drainage veins are evident. 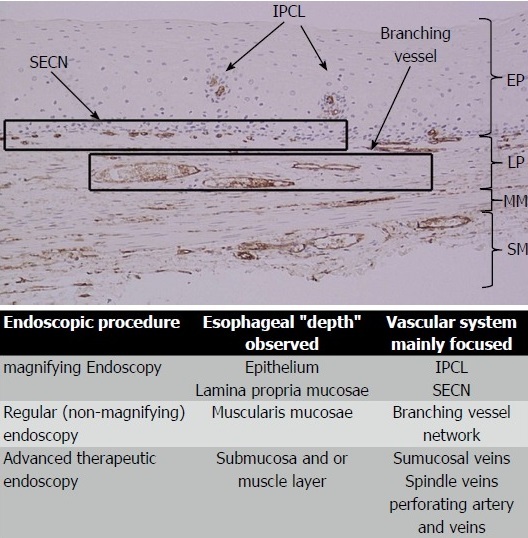 The table summarizes the vascular system observed and its own esophageal layer according to the different endoscopic procedure performed. 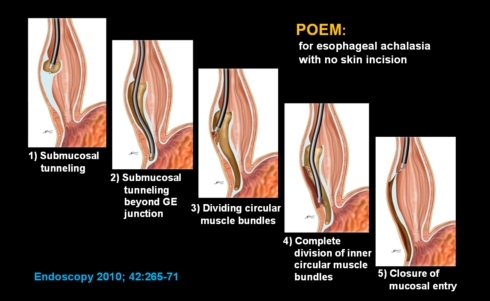 In the center a scheme of the submucosal view at the gastro-esophageal junction during per-oral endoscopic myotomy. 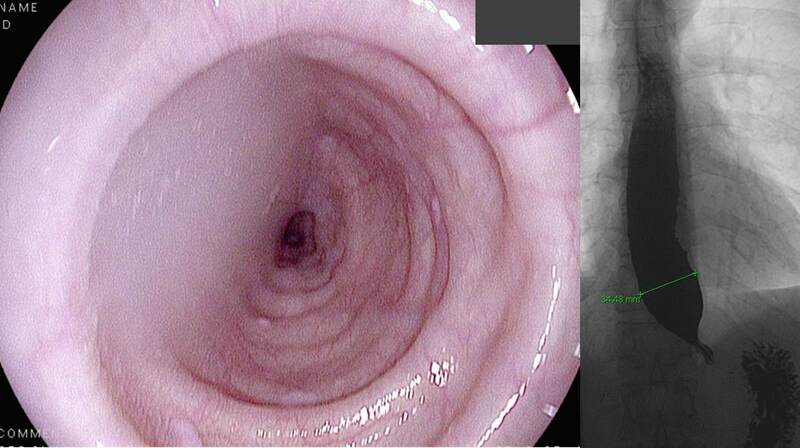 At the muscle side (left endoscopic image) the spindle vein are clearly visible; at the mucosal side (seen on its backside, right endoscopic image) the palisade vessel are recognized. High magnification images. Oblique slin fibers centered along the posterolateral wall (7 o'clock) wraing around the anterioa (11 o'clock) and posterior (5 o'clock) walls. 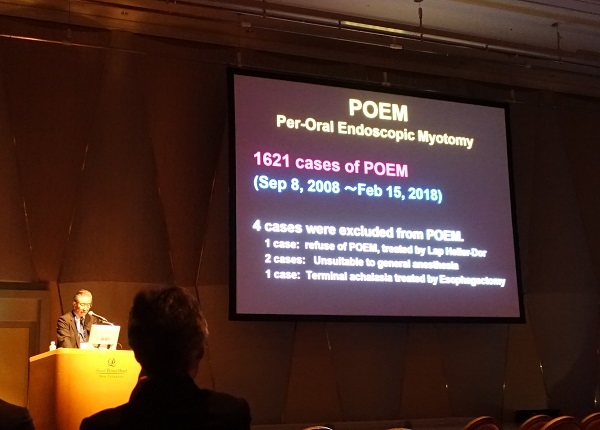 일본의 Dr. Inoue가 개발한 POEM (peroral endoscopic myotomy for achalasia)는 achalasia에서 점차 많이 적용되고 있습니다. 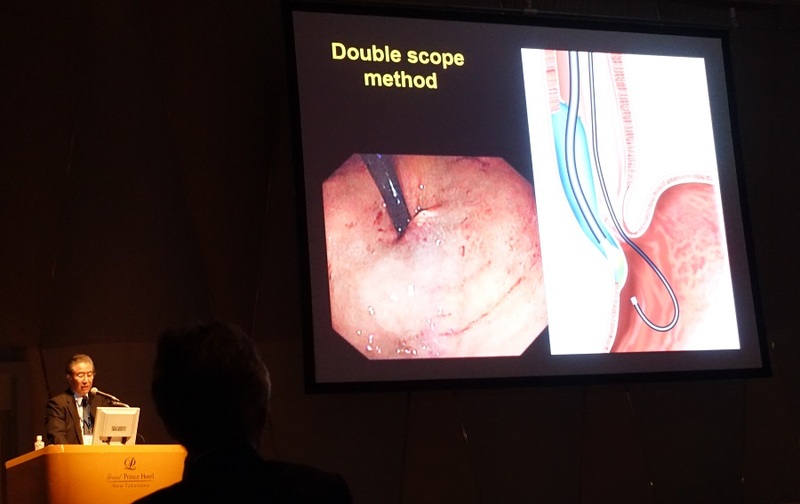 2010년 Endoscopy지에 실린 Dr. Inoue 논문이 많이 인용되고 있습니다. Dr. Inoue는 약 300예 정도의 경험이 있다고 합니다. 중국 상하이의 PH. Zhou 박사는 2000개 이상을, 인도의 A. Maydeo 선생님은 600개 이상을 경험했다고 합니다. 정훈용 선생님은 Learning curve가 20개 정도는 되는 것 같다고 하십니다. Classic achalasia이고 식도 체부에 이상이 없으면 짧게 잘라도 되지만 식도 체부에 spasm이 있으면 그보다 상부에서부터 LES 하방까지 길게 잘라주어야 합니다. Inoue 는 TT knife로 우상방에서 좌하방으로 2시 방향으로 자르는 것을 좋아하는데, 정훈용 선생님은 hook knife를 이용하여 아래에서 위로 자르는 방법을 선호한다고 합니다. 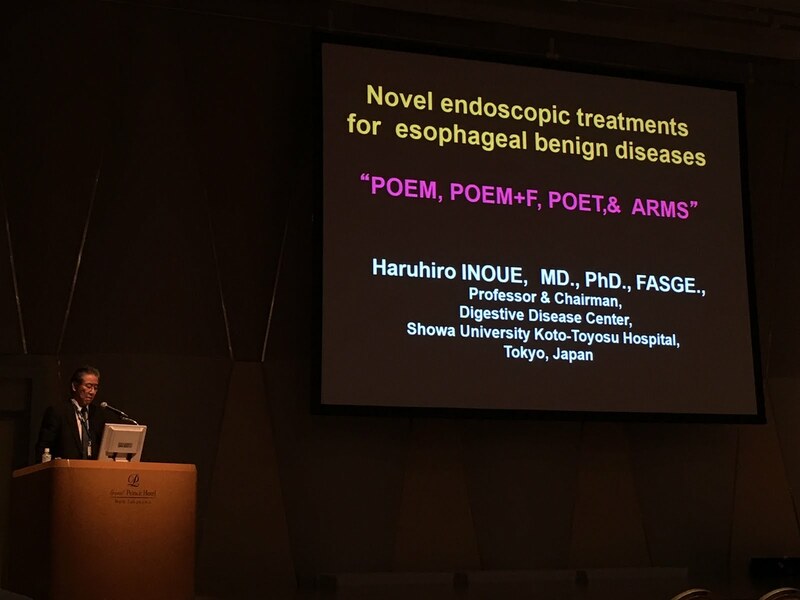 POEM 후 증상은 현저히 좋아지지만 esophagography의 delayed emptying, manometry의 이상소견 등은 크게 좋아지지 않는 경우가 많다고 합니다. Subjective한 성적과 objective한 성적의 차이가 가능하니 주관적인 증상개선을 중요시해야 한다고 생각됩니다. Achalasia인데 POEM이 어려웠던 환자가 최종적으로 tracheobronchial remnant로 진단된 소아환자를 소개하여 주셨습니다. 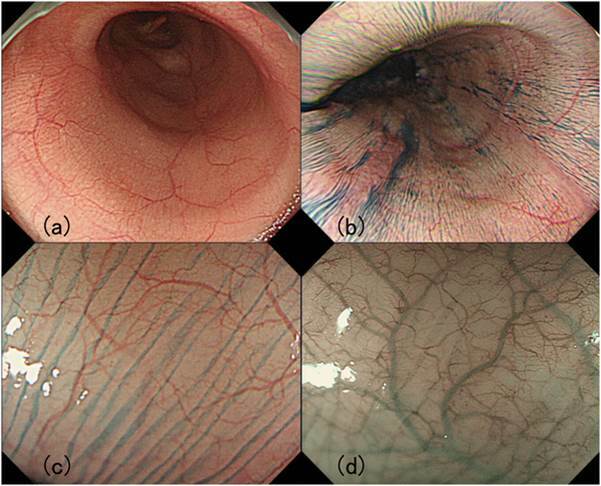 Congenital anomaly의 하나인데 segmental resection으로 잘 치료되었다고 합니다. 강사의 말씀 중 아래와 같은 언급이 가장 인상적이었습니다. "1995년 조기위암 내시경치료를 처음 시작한 후 환자가 좋아하는 정도에 비하여 achalasia 환자가 POEM 후 좋아하는 정도가 100배는 됩니다. 환자 입장에서 한번 치료 후 삶의 질이 가장 좋아지는 시술이 POEM입니다. 환자들이 매우 좋아합니다." Vigorous achalasia의 치료효과는 예측하기 어려웠습니다. Heterogenous한 group이었기 때문입니다. High resoluation manometry는 vigorous achalasia를 type II와 type III로 나누어줍니다. 식도 체부의 pressurization이 남아있는 type II는 예후가 좋은 편입니다. 하부식도의 spasm을 보이는 type III는 환자 수는 적지만 예후는 가장 나쁜 형태입니다. NOTES로부터 개발된 submucosal tunnel technique은 다양하게 진화하고 있습니다. 그중 가장 실용화된 것이 POEM입니다. POEM의 가장 최근 결과입니다. 비록 환자 수는 적지만 type III에서도 효과가 있다는 것을 보여주고 있습니다. 2015년 3월호 Gut and Liver에 중국의 Quan-Lin Lin과 Ping-Hong Zhou 선생이 POEM에 대한 흥미로운 리뷰를 실었습니다 (Perspective on POEM for achalasia: Zhonshan experience). POEM 시술의 개념은 미국 텍사스의 시골 Galveston의 Pasricha 선생이 2007년 동물실험을 통하여 제시하였습니다 링크). 미국 사람들이 사람에게 적용하는 것을 주저하는 사이에 일본의 Inoue 선생이 수십예를 성공시켜 세상에 알렸습니다 (링크). 이를 본 중국의 Quan-Lin Lin과 Ping-Hong Zhou 선생이 단기간에 매우 많은 시술을 성공시켜 세계 최고 대가가 되었습니다. 이번 리뷰를 보면 1,300예를 했다고 합니다. 전 세계 POEM의 절반 이상을 한 센터에서 했다고 자랑하고 있습니다. 놀라운 인해전술입니다. 중국은 특정 시술을 특정 의사에게 밀어주는 경향이 있습니다. 금방 n-값이 세계 최고가 됩니다. 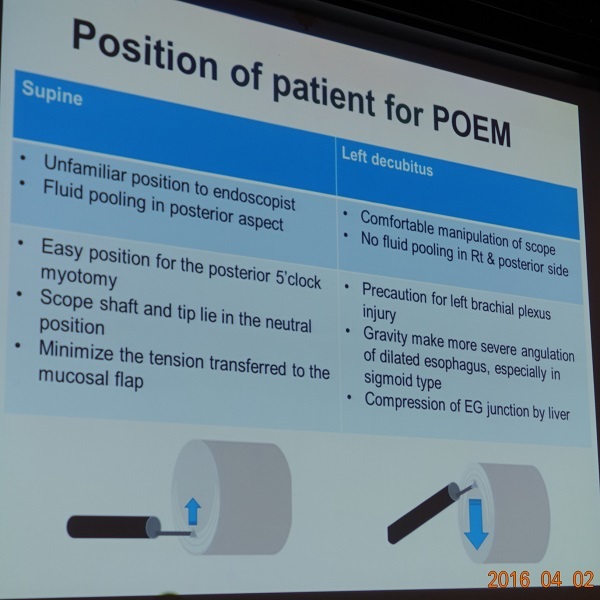 그들은 (1) posterior wall incision, (2) full-thickness myotome, (3) a push-and-pull technique for myotome, (4) water-jet assisted POEM이라는 4가지의 독특한 방법론을 개발하였습니다. 이를 통하여 매우 빠른 속도를 자랑하고 있습니다. 몇 번 시술을 본 적이 있는데 정말 순식간에 끝납니다. 숙련도가 세계 최고입니다. 이번 리뷰에서 흥미로웠던 문장 몇 개를 옮깁니다. - We routinely divide muscle fibers over a minimum length of 6 to 8 cm in the esophagus and at least 2 cm onto the cardia. 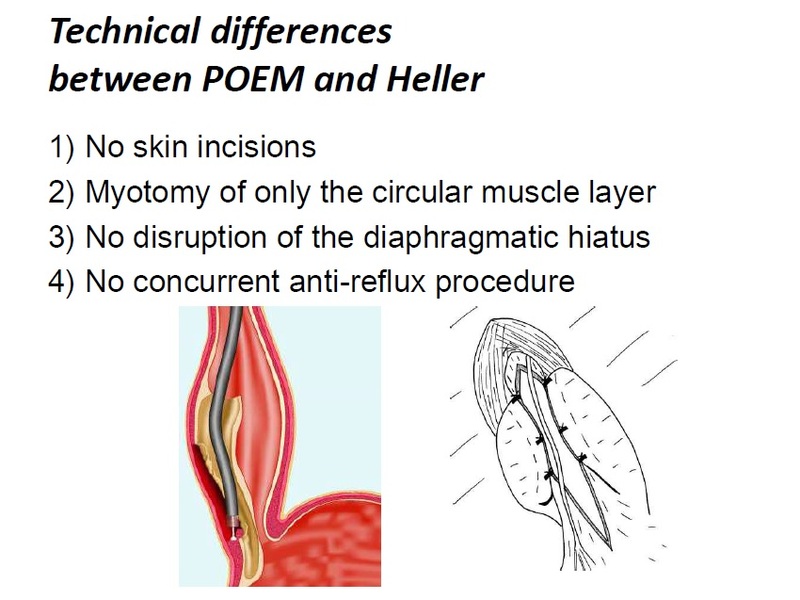 - Posterior myotomy in the 5- to 6-o’clock position also achieves myotomy from the luminal side without disturbing the acute angle of His, which is located at the 8-o’clock position: this is important to prevent reflux. - A clear separation of circular (to be completely dissected) and longitudinal (to be left) muscular layers cannot be found any more at the EGJ and stomach. - Full-thickness myotomy significantly reduced the procedure time but did not increase the procedure-related adverse events or clinical reflux complications. - A Sengstaken-Blakemore tube is particularly effective for providing compressive hemostasis to staunch post-POEM bleeding. 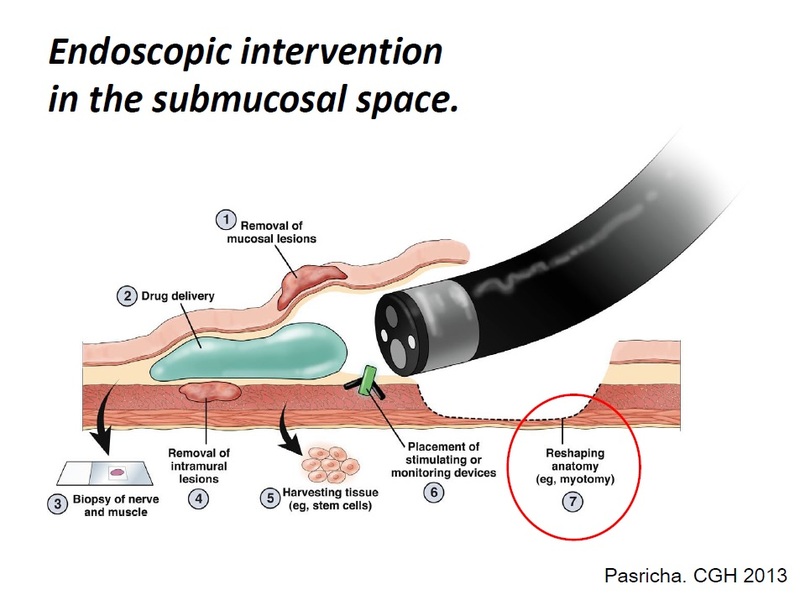 Submucosal tunnel을 만들 때 점막하층 깊은 부위를 절개해야 합니다. Mucosal injury를 줄일 수 있기 때문이다. Sigmoid type achalasia에서는 방향을 잡기 어렵습니다. Circulr muscle과 직각 방향으로 진행해야 합니다. 여러 종류의 knife를 시도해 보았지만 selective circular muscle cutting에는 triangle knife가 가장 유리합니다. 최근에는 시작부터 끝까지 triangle knife만 이용하고 있습니다. Positive pressure ventilation이 필요합니다. Myotomy를 시작하기 전 마취과에 PEEP을 걸어달라고 요청하고 있습니다. 지난 9년 동안 Showa 대학과 Nagasaki 대학에서 시술한 1,000예의 자료입니다. Minami 선생님은 Inoue 선생님이 세계 최초의 POEM을 할 때 fellow로서 assist를 했습니다. 지금까지 Showa 대학에서 900예 이상 (최근 1년에 200예 이상을 시술하고 있습니다), Nagasaki 대학에서 100예 이상의 POEM이 시술되었습니다. Diffuse esophageal spasm에서는 myotomy length를 더 길게 합니다 (20cm 까지). 식도이완불능증에서 식도암 발생률이 높은데 POEM 후 식도암 발생률이 낮아지는지는 아직 불명확합니다. 일본에서 POEM 시술료는 약 15만엔입니다 (우리 돈으로 150만원 정도). 아직 보험급여가 되지 않아서 시술료는 환자 부담인 모양입니다. 입원, 주사, 병실료 등은 보험 급여가 가능하여 환자는 일부만 부담합니다. 윤교수님은 myotomy 위치에 대하여 상세히 설명하셨습니다. 2시 방향은 sling fiber가 보존되므로 POEM 후 GERD가 덜 발생하고, 5시 방향은 sling fiber가 disrupt되므로 EG junction relief가 더 좋습니다. 최근에는 대부분의 시술자가 5시 방향(posterior approach)을 선호합니다. 혹자는 5시 방향으로 시술하더라도 조심스럽게 시술하면 sling fiber를 살릴 수 있다고 합니다. 내시경을 자연스럽게 잡고 가장 접근하기 쉬운 곳을 자르면 그곳이 대강 5시 방향입니다. 일본의 Dr. Inoue도 과거에는 2시 방향을 선호하다가 최근에는 5시 방향으로 시술하고 있다고 합니다. Dr Inoue의 최근 review에서 해당 부분을 옮깁니다 (Bechara R, Inoue H. Gastrointest Endosc 2016 - Epub). The techniques used to perform a selective myotomy vary depending on the position of the mucosal incision as well as endoscopic orientation. When the muscle layer is in the 12 o’clock and the mucosa at 6 o’clock position (generally for anterior myotomy), acute tip angulation is required to hook the circular muscle layer. In contrast, when the muscle is kept in the 6 o’clock position (generally for posterior myotomy, which is our current practice), much less tip angulation is required and there is less "fling" of the knife. Dr. Fass는 미국에서는 POEM 후 GERD가 훨씬 흔하고, stricture도 종종 발생한다고 코멘트 하셨습니다. .
Dr. Fass는 EG junction outflow obstruction도 POEM의 적응증이 되는지 질문하였고, 윤교수님은 possible future indication일 수 있지만, 아직 그 질환을 잘 알지 못하고 botox로 치료되는 경우가 많아 아직 시술하지 않다고 답하셨습니다. Achalasia는 high resolution manometry 소견을 바탕으로 아래와 같은 subtype으로 나눌 수 있습니다. 이러한 subgroup에 따라 현미경 소견에 차이가 있다고 합니다. 즉 achalasia는 pathogenetically heterogeneous group일 것입니다. FLIP을 GE junction의 모습을 보여주는 방법인데 Carlson DA 등은 새로운 프로그램을 이용하여 FLIP topography plot를 보여주는 방법을 개발하였습니다 (Carlson DA. Gastroenterology 2015). 홍수진 선생님은 2012년 8월 8일 첫 POEM 시술을 하였습니다. 홍교수님은 최근에는 HybridKnife T type (ERBE, Germany)을 주로 사용한다고 합니다. (이준행 comment: 가격이 비쌀 것 같은데...) Myotomy 방향은 과거에는 1-2시를 사용하였으나 최근에는 4-5시를 사용한다고 합니다. 2016-4-2. 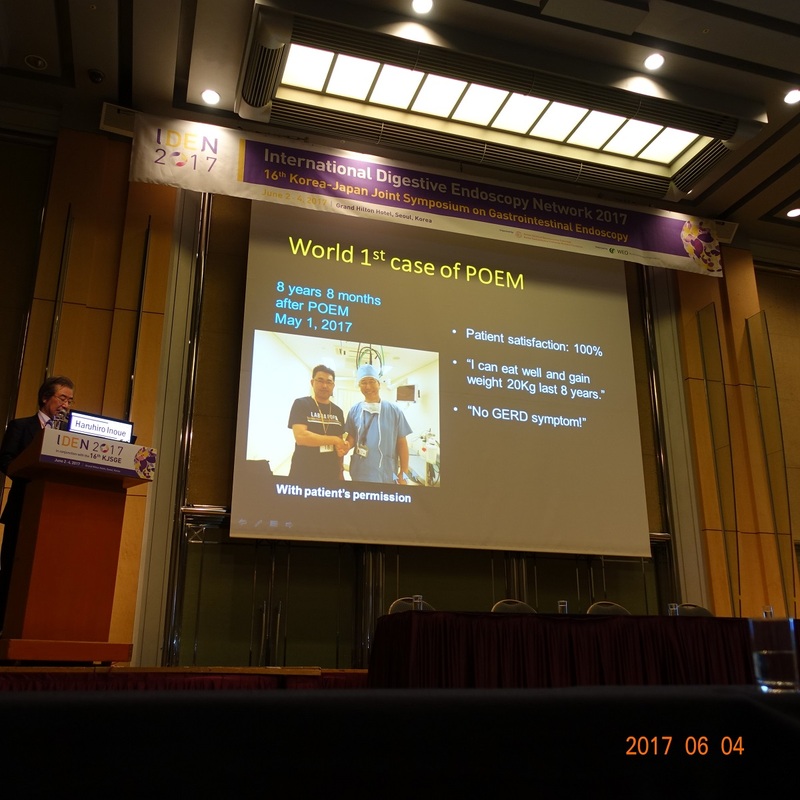 APNM2016에서 연세대 윤영훈 교수님께서 보여주신 사진을 참고하세요. 시술 도중 bleeding이 발생하면 시야를 잃을 수 있으므로 주의해야 합니다. Pneumoperitoneum이 발생하면 공기를 빼 주어야 하는 경우가 있으므로 복부를 늘 볼 수 있도록 해야 합니다 ("direct visualizaion). Jackhammer esophagus 환자에서 myotomy의 길이를 정하는 것에 대하여 상세히 설명하였습니다. LES function을 남길 것을 권하였습니다. Minami 선생님은 3 개의 clinical questions을 제시하고 의견을 주셨습니다. (1) Does previous interventions affect feasibility and safety of POEM? (2) How long do we have to cut the muscle? A. Still inconclusive. 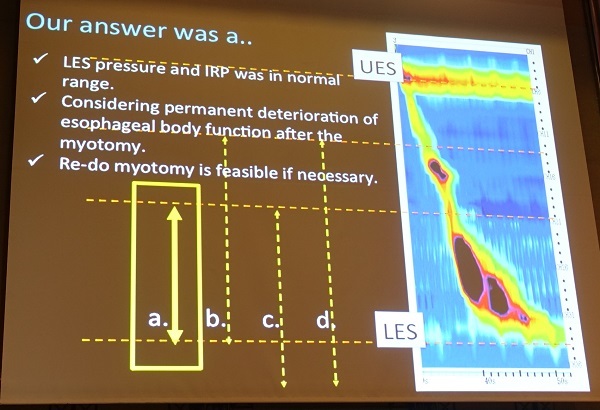 If the abnormal contraction of the esophageal body was only a secondary change, myotomy should not be too long in order to avoid dysfunction of the esophageal body. (3) Which is better? Anterior? Posterior? A. Longer observation with more cases is awaited. Multicenter RCT is now ongoing. 조주영 좌장님께서는 simultaneous bilateral POEM에 대하여 질문하셨는데 Minami 선생님은 시술 경험은 없다고 답하셨습니다. Pneumatic dilatation의 시대는 가고 POEM의 시대가 왔습니다. Vigorous achalasia에서는 myotomy를 길게 할 필요가 있습니다. Inoue 선생님은 23 cm myotomy를 시행하였던 증례를 보여주었습니다. 수술로는 이런 긴 myotomy를 할 수 없기 때문에 긴 myotomy를 할 수 있다는 것이 내시경 치료의 장점 중 하나입니다. 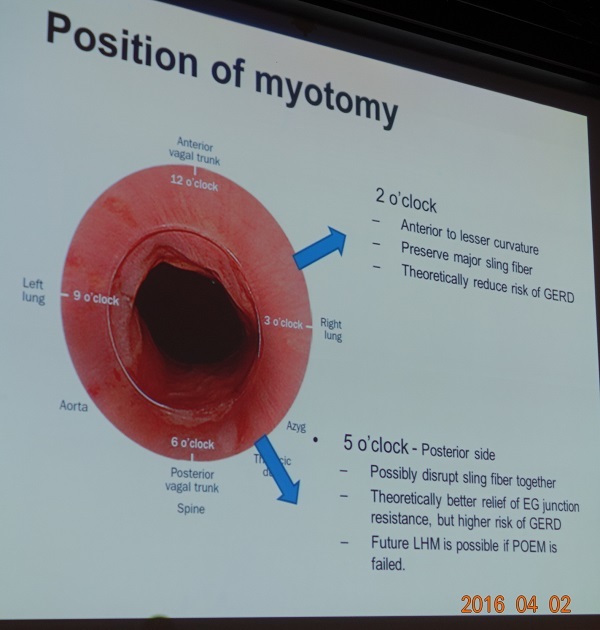 Jackhammer esophagus에서도 긴 myotomy가 필요합니다. 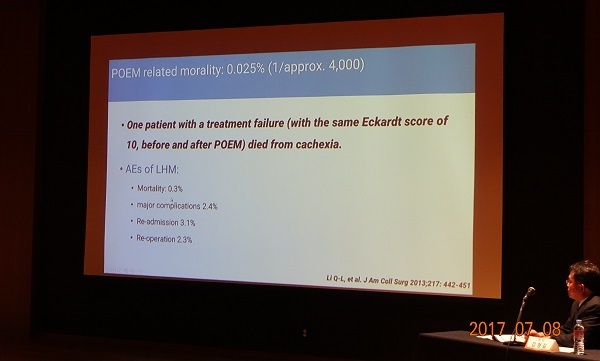 지금까지 1000여명의 POEM 중 5증례의 Jackhammer esophagus가 있었다고 합니다. Jackhammer esophagus에서 body myotomy와 함께 LES myotomy가 필요한지는 아직 불명확합니다. Inoue 선생님 첫 Jackhammer esophagus 환자에서 body myotomy만 했는데 3년 후 achalasia가 발생하여 다시 POEM을 했습니다. 그 이후로는 body myotomy와 LES myotomy를 함께 하고 있다는데 GERD가 발생하는 것이 문제라고 합니다 . Inoue 선생님은 two endoscopy method를 자주 사용한다고 합니다. 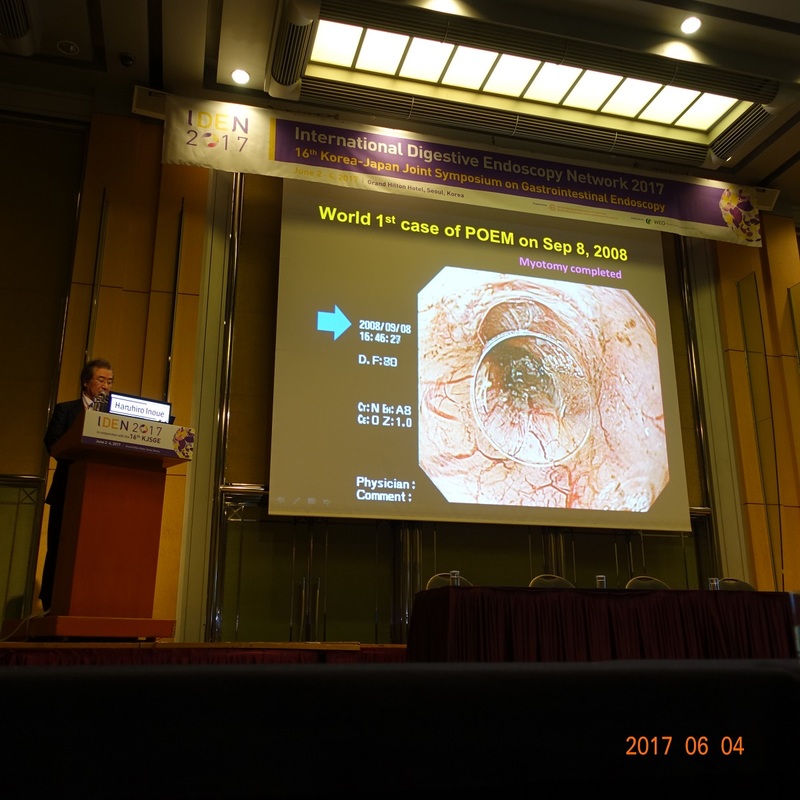 POET (Peroral endoscopic tumor resection): aberrant pancreas in the esophagus 치료 예를 보여주었습니다. 수개월에 한번 반복적인 증상이 생기는 환자고 식도에 pancreatic duct opening이 있었습니다. POEM과 비슷한 방법으로 치료했다고 합니다. Inoue 선생님은 laparoscopic Heller myotomy의 적응증은 더 이상 없다고 말하면서 historical 시술이 되었다고 언급하였습니다. Anterior myotomy의 유일한 문제는 이 부위에 big perforating artery가 있는 환자가 있다는 것입니다. Lateral myotomy는 좋지 않습니다. 식도의 lateral 영역은 폐와 닿는 부위이므로 음압으로 인하여 POEM 후 큰 diverticulum이 발생할 수 있기 때문입니다. Diffuse esophageal spasm 증례는 LES myotomy를 하지 않고 esophageal body만 길게 myotomy를 해 주고 있습니다. Gastric POEM G-POEM는 very simple procedure입니다. Entry site와 myotomy site가 매우 가깝기 때문입니다 (이 이유를 물어보았는데.... myotomy의 길이가 2cm로 짧기 때문에 submucosal tunnel이 짧아도 되고 시술이 어렵지 않다고 합니다). 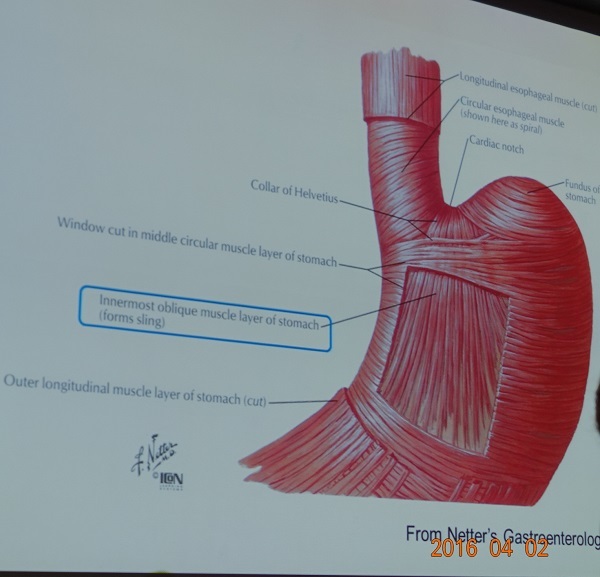 Duodenal muscle은 매우 thin하여 십이지장 근육은 myotomy를 하지 않습니다. 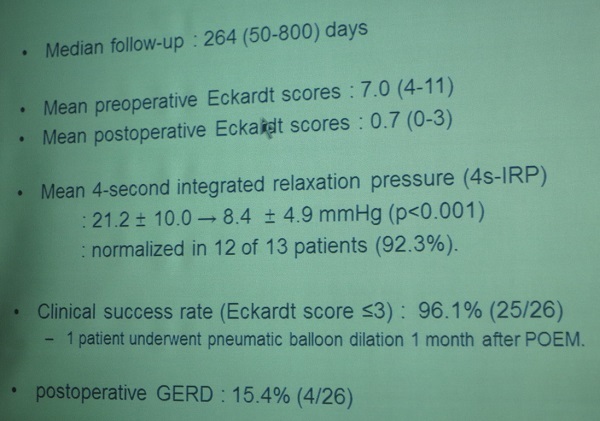 POET (peroral endoscopic tumor resection) - endoscopic submucosal tumorectomy를 POEM 비슷하게 시술하는 것입니다. Full layer resection in the esophagus (ectopic pancreas가 repeated mediastinitis를 일으켰던 경우)라는 놀랍고 무서운 시술을 소개하셨습니다. Preservation of the mucosa intact is the most important. Hook knife를 사용한 증례가 있어서 질문을 했는데요... 보통은 triangle knife를 사용하지만 매우 까다로운 경우, fine한 시술을 해야하는 경우에는 hook knife를 사용하기도 한다고 합니다. [이준행 comment] IDEN 2017 Inoue 선생님 강의를 들으면서 더없이 부러웠습니다. 2008년 9월 8일 오후 세계 최초 POEM 시술 장면을 동영상으로 보여주셨습니다. 현재 technique과 거의 동일한 방식이었습니다. 게다가 세계 최초 POEM 시술 환자를 2017년 5월 다시 만나 함께 찍은 사진을 자랑스럽게 소개하셨습니다. 그러니까 첫 시술 8년 후 다시 그 환자를 만나 뿌듯해하셨던 장면입니다. 잘 먹지 못하던 환자가 POEM 시술 후 20kg나 늘었다고 좋아했다는 것입니다. 얼마나 부럽습니까. 정말 대단하다고 생각합니다. (1)Heller myotomy: Open보다는 laparoscopic이 좋고, thoracoscopic보다 laparoscopic이 좋고, full 보다 partial이 좋습니다. ESD와 달리 general anesthesia, positive pressure ventilation, CO2 insufflator, IV antibiotics가 필요합니다. 가능하면 deep tunneling을 해야 합니다. (1) 어짜피 myotomy를 할 것이므로 일부 손상이 되어도 상관이 없습니다. (2) Muscle이 두꺼워서 천공이 잘 발생하지 않습니다. (3) Mucosal flap을 보호하는 것이 훨씬 더 중요하기 때문입니다. (4) 방향을 잃지 않기 위하여 muscle fiber를 보고 직각으로 방향을 잡아야 하기 때문입니다. Non-achalasia에서 POEM을 할 경우에는 환자 selection에 훨씬 주의해야 합니다. Diffuse esophageal spasm의 manometry 소견은 GERD에서도 일시적으로 보일 수 있으므로 진단에 주의해야 합니다. Non-achalasia에서 POEM을 하면 LES pressure가 떨어져 산역류가 증가하여 오히려 GERD 증상이 악화될 수 있습니다. Spastic motility disease에서 ice water를 사용하여 contraction을 유발하면 치료범위 결정에 도움이 될 수 있습니다. 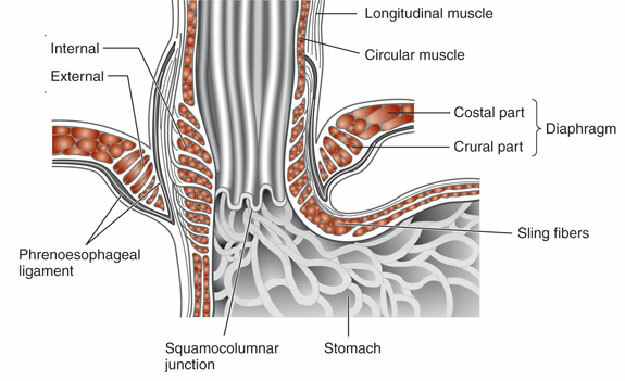 [정훈용 좌장님 comment] Dysphagia로 오는 non-achalasia spastic disease 환자에서 circular muscle contraction이 주된 증상의 원인입니다. IRP가 높다고 POEM을 하면 누워서 자지 못하는 경우가 발생할 수 있으므로 우선 PPI를 써서 증상 호전 여부를 보는 것이 좋겠습니다. [이준행 질문] Non-achalasia spastic disorder에서 body peristalsis를 하고 LES myotomy를 하지 않으면 좋을 것 같은데... body와 LES의 연결부분을 어떻게 구분할 수 있습니까? [윤영훈 교수님 답변] Incisor로부터의 거리로 판단할 수 밖에 없으며, 간혹 oblique한 muscle fiber가 보이면 LES에 가까이 온 것으로 판단할 수 있습니다. 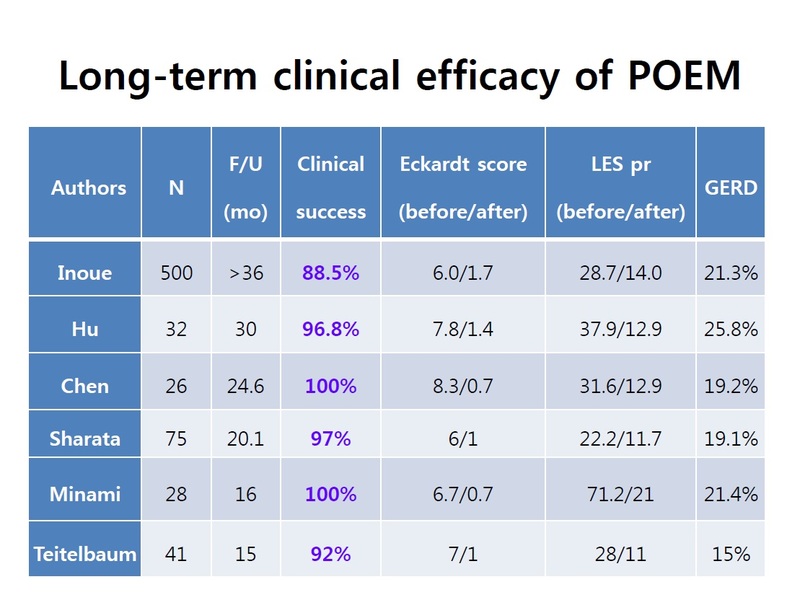 Learning rate of 8-13 cases - 김도훈 선생님께서는 13번째 POEM부터 그 전과 확연히 다르다는 느낌을 받았다고 합니다. 시술 1-5일 전부터 잔존 음식을 최소화하기 위한 음식 조절이 필요합니다. 시술 하루 전에 입원하는데, 시술 전날 내시경 검사를 시행하여 위내 잔존 음식물 여부를 확인하고 필요하면 잔존 음식물을 제거해야 합니다. Circular muscle fine fiber가 보일 정도로 충분히 깊게 한다. 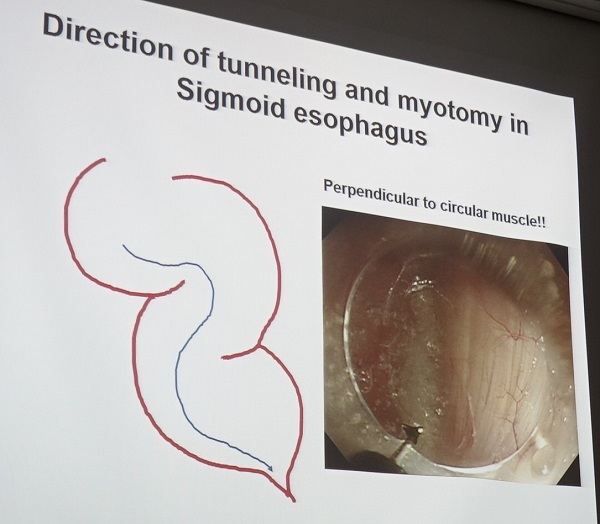 Circular muscle fiber 주행의 수직 방향으로 터널링을 해야 하며, sigmoid esophagus의 경우 더욱 그러하다. 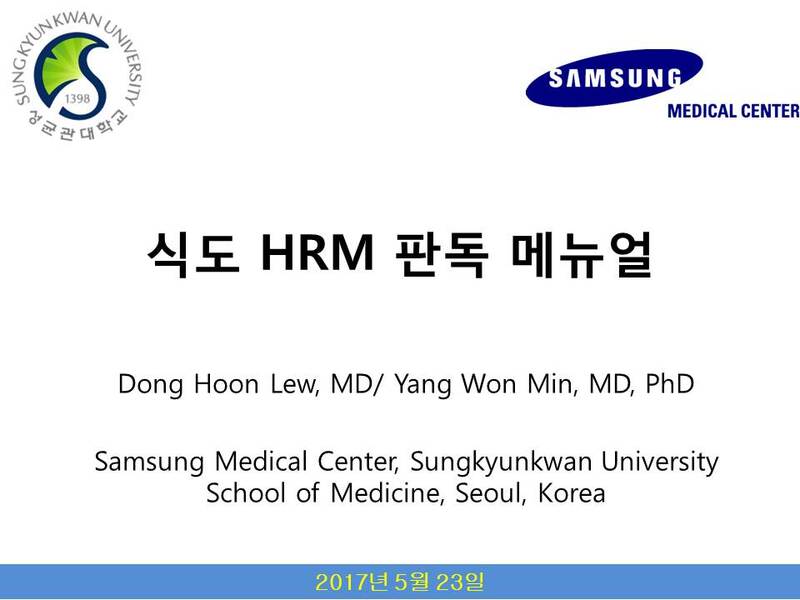 Achalasia 근층은 정상보다 두꺼우므로 근층 천공을 겁내지 말자. 점막하 터널 상바의 점막 손상에 주의하자. - Circular muscle에 가장 가깝게 절개 박리를 한다. - 근층의 경한 열손상은 경과에 영향을 미치지 않으나, 점막 손상은 천공을 야기한다. - 터널의 점막측 출혈에 대한 지혈은 신중하게 한다. 점막하 터널의 위장측에 도달하면, 혈관 밀도와 직경이 증가하여, 큰 혈관에 대해서는 예방적 지혈을 하는 특별한 주의가 필요하다. 위 분문부 점막은 더 얇아서 점막 천공의 위험성이 높다. Longitudinal fiver를 자르지 않는 선택적인 circular muscle myotomy를 하기 위해서는 inter-muscle space에 도달하기까지 단계적으로 근절개를 시행해야 한다. Selective myotomy를 정확히 할 수 없는 경우는 조심스럽게 full thickness myotomy를 단계적으로 시행하는 것이 필요하다. Incomplete cardiomyotomy가 치료 실패와 증상 재발의 가장 흔한 원인이기 때문이다. POEM은 고도로 숙련된 내시경 의사가 시행해야 하는 어려운 술기라고 말씀주셨는데요, ESD를 자주 시행하지 않는 서양 의사들은 ESD보다 POEM이 훨씬 쉬운 시술이라고 말하고 있습니다. 선생님은 어떻게 생각하시는지요? ESD 전문가들은 매우 섬세하게 경우에 POEM을 시행합니다. 그러나 ESD 경험이 없거나 적은 서양 혹은 인도 의사들은 POEM을 적당한 술기로 시행을 합니다. Myotomy도 selective하게 하지 않고 대강 TT knife로 쭉 자르고 있습니다. 식도 ESD와 POEM은 상호 보완적인 시술입니다. POEM을 시행함에 있어 식도 ESD 경험이 크게 도움이 되었습니다. 식도 ESD를 시행함에 있어 POEM을 통하여 알게 된 하부 구조에 대한 이해가 도움이 되었습니다. 식도 ESD와 POEM을 모두 시행하면서 위와 아래를 모두 알게되었다는 점에서 좋았습니다. Achalasia는 subtype에 따라서 치료방침을 정할 수 있습니다. 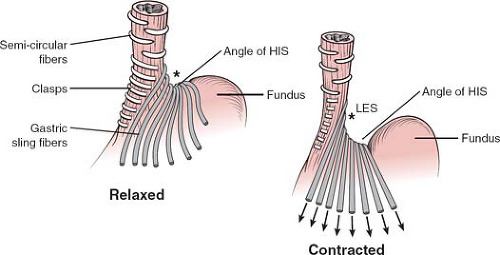 Spastic or hypercontractile esophagus에 대한 POEM에 있어서 LES myotomy를 해야하는가 논란이 있습니다. Inoue 선생님은 향후 achalasia로 진행할 수 있고, POEM 이후 식도 체부의 ineffective peristalsis로 인한 dysphagia나 regurgitation이 가능하므로 미리 LES myotomy를 하는 것이 좋겠다는 의견을 낸 적이 있습니다). 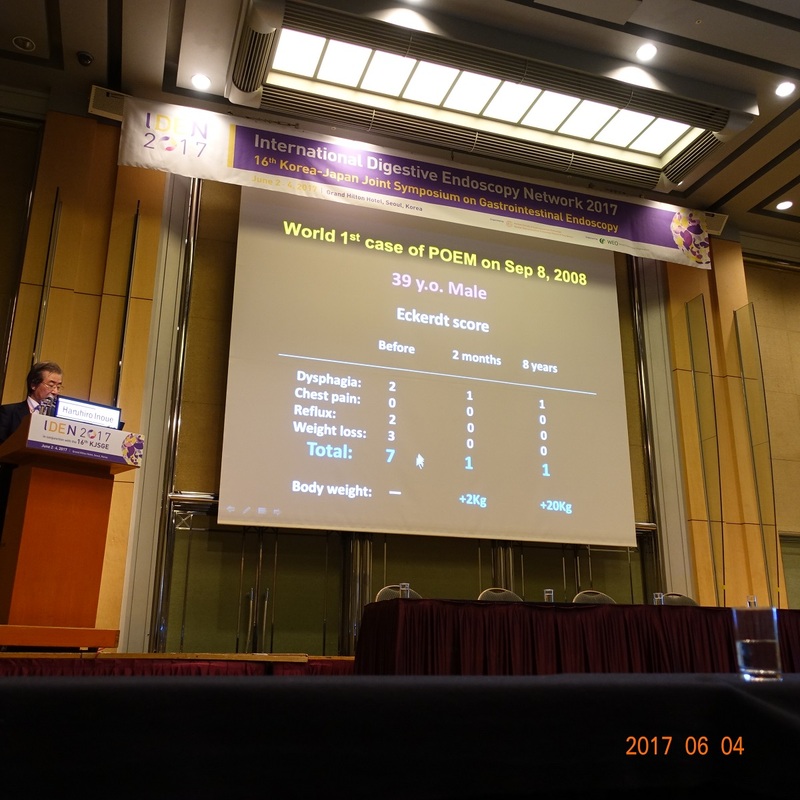 2017년 Digestion지에 실린 논문(Digestion 2017;95:29-35)을 인용하시면서, achalasia 중 type II에 대해서는 balloon dilatation을 first choice로 말씀주셨는데요, 일정 수준의 learning curve를 통과한 기관의 경우 POEM의 안정성과 효과를 고려할 때 모든 achalasia의 first choice로 POEM을 추천하는 전문가도 많은 것으로 알고 있습니다. 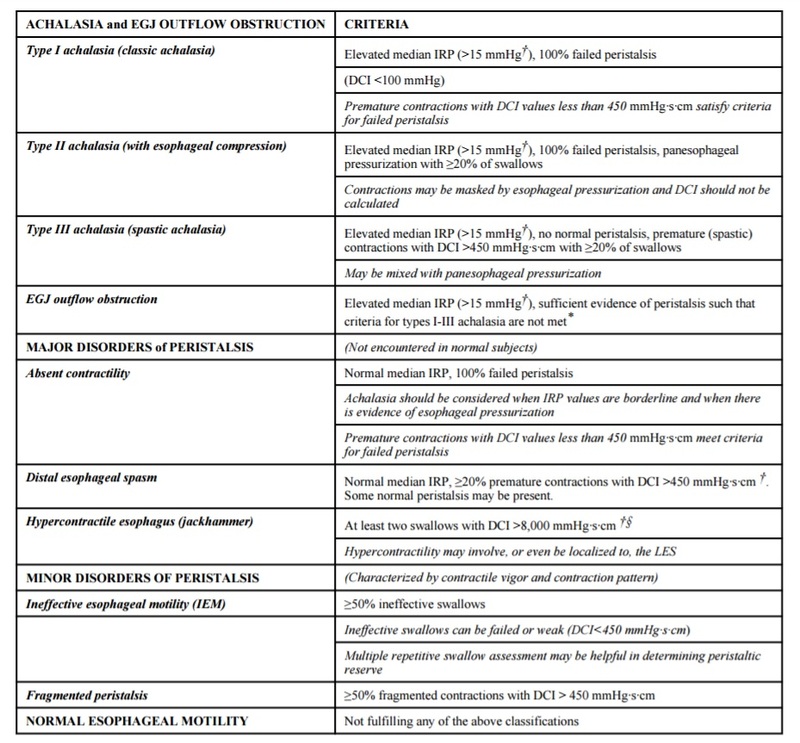 Balloon dilatation과 POEM의 randomized study가 있으면 좋겠지만, POEM을 시행하는 기관에서는 POEM만을, balloon dilatation을 시행하는 기관은 balloon dilatation만을 시행하고 있는 상황입니다. 저는 대부분 POEM으로 치료하고 있습니다. 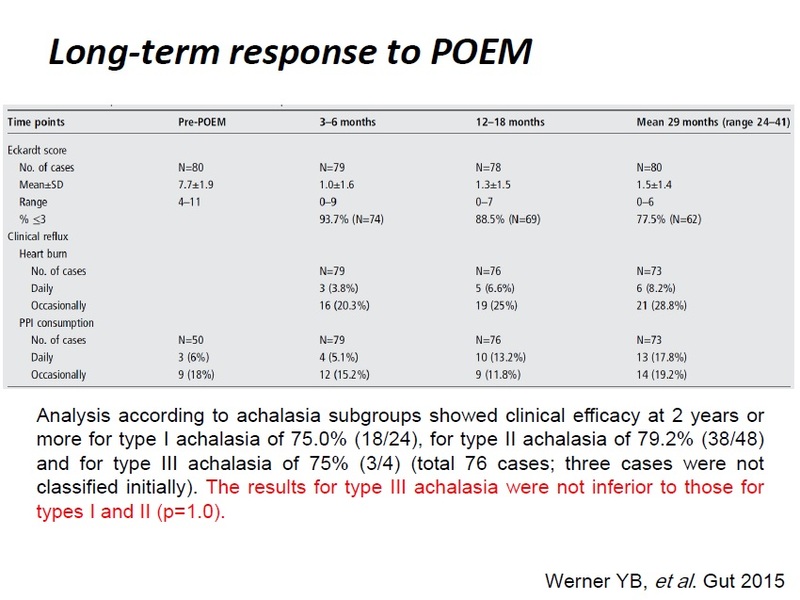 POEM 술기가 확립되었기 때문에, 현재로서는 특별한 경우 아니면 type과 무관하게 모든 achalasia 치료의 primary choice로 POEM을 선택하는 것이 타당할 것 같습니다. 현재까지 POEM과 관련된 사망은 1예가 보고되어 있습니다. 정현수 교수님께서는 POEM 후 심한 reflux 증상을 호소한 환자를 소개하여 주셨습니다. POEM 과정에서 full thickness myotomy가 되었던 환자인데 PPI response가 없었습니다. 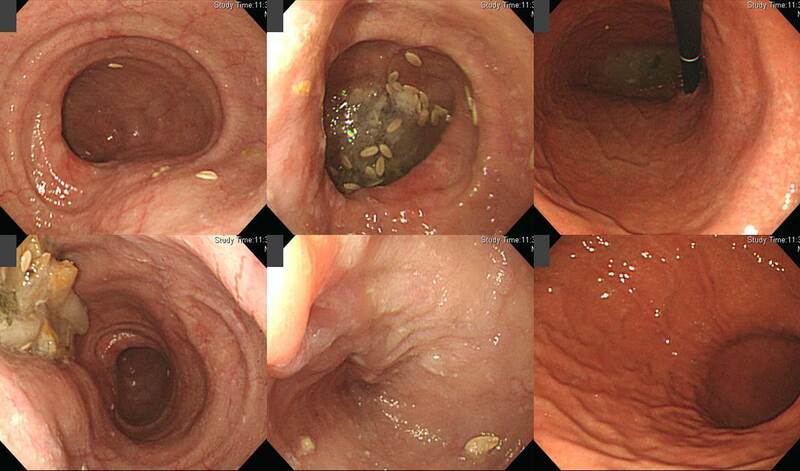 내시경에서 pyloric ring contraction이 지속된 양상이었고 gastric emptying study에서 delayed emptying을 보였습니다. Full thickness myotomy와 관련된 vagus nerve damage를 의심하여 pyloric ring 주변에 Botox injection을 하였고 즉시 증상이 호전되었습니다. 조주영: Supine position으로 시술하고 있습니다. (Left decubitus로 3시간 이상 시술하다보면 palsy가 올 수 있기 때문입니다) Normal salin 100cc에 hyaluronic acid 1 ampule을 섞어서 사용하는데, hyaluronic acid 농도가 진하면 연기가 많이 나는 경향이 있습니다. Blue dye를 진하게 쓰면 perforating vessel이 안 보이기 때문에 dye를 약하게 사용하고 있습니다. Dual knife를 이용하여 spray coagulation mode, effect 2, 40 watt를 사용합니다. Spray mode는 non-contact 방법이므로 Dual knife의 needle을 앞으로 내밀지 않고 submucosal dissection 할 수 있습니다. Pneumoperitoneum이 발생하면 환자의 상태가 안 좋아지기 때문에 angiocath를 이용하여 복부의 gas를 제거하고 있습니다. Pneumomediastinum에서 간혹 tension pneumothorax가 발생하여 급히 chest tube를 해야 하는 경우가 있습니다. 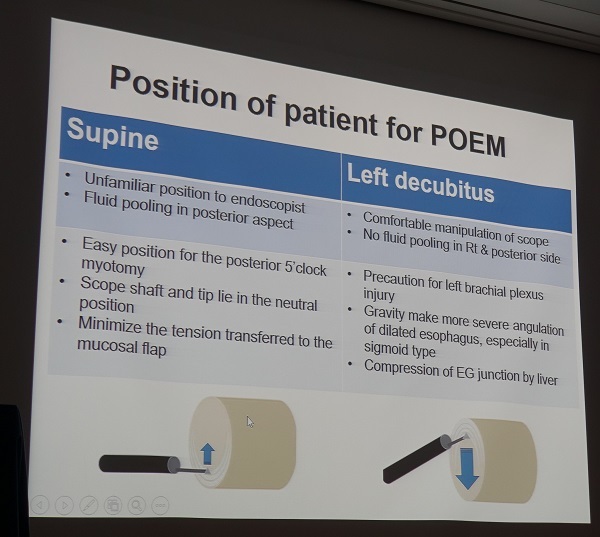 Diaphragm level에서 (간혹 심한 achalasia에서 stenosis가 있는 경우는) 공간이 좁고 뻣뻣하기 때문에 내시경 진행이 어려울 수 있습니다. (1) cap을 빼고 시술하거나, (2) 부분적인 myotomy를 먼저 시행해 주는 방식을 쓸 수 있습니다. Cardia로 들어가면 submucosal tissue가 loose해지는데, 이때부터는 혈관을 잘 보고 pre-emptive coagulation을 하는 것이 좋습니다. 일본 후생성에서 POEM 시술료를 15만엔 정도로 설정한 상태입니다. 차병원에서 환자가 내는 비용은 총액 400-500만원 정도 내는 것 같습니다. (다른 선생님들은 시술비를 200-350만원 정도라고 말씀하셨음) 일본에서는 후생성에서 POEM 시술료를 15만엔 정도로 정해놓았다고 합니다. 고교수님은 Myotomy는 FineMedix 사의 hook knife, Swift coagulation으로 시술하였습니다 (FineMedix 사의 hook knife가 길어서 유리하다고 합니다). 식도는 selective myotomy를 하더라도 longitudinal muscle이 함께 절제되는 경우가 많습니다. EG junction 부분은 고의적으로 full thickness myotomy를 하기도 합니다. Type I의 경우 circumferential muscle이 워낙 얇기 때문에 저절로 full thickness myotomy가 되기도 합니다. Tunneling은 천천히 myotomy는 아주 빠르게 시행하고 있습니다. 공기를 적게 넣고 빠른 속도로 myotomy를 해야만 pneumomediastinum, pneumoperitoneum의 발생률이 낮고, 혹시 발생하더라도 공기가 적게 들어가 환자가 빨리 회복됩니다. 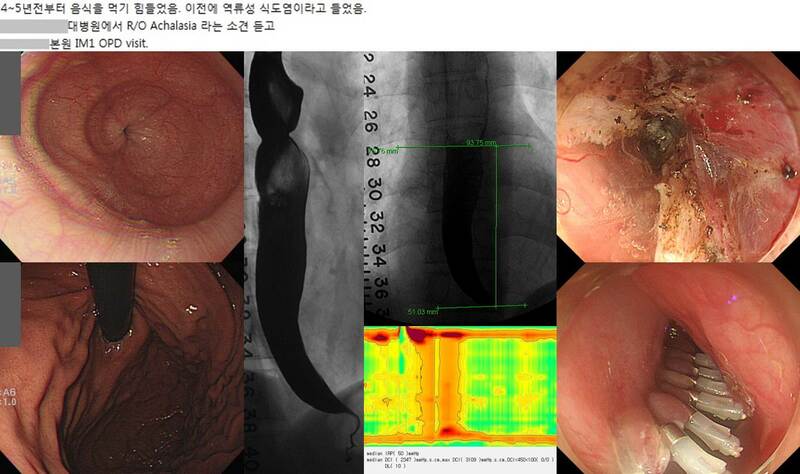 조주영 교수님은 POEM 후 reflux가 심하여 2명에서 antireflux endoscopic treatment를 하였다고 말씀하셨습니니다. POEM 초기에 incision을 horizontal한 방향을 사용하였는데 그때는 closure가 어려웠다고 합니다. 요즘은 항상 longitudinal하게 incision을 하기 대문에 clipping이 어려운 경우는 거의 없는 것 같습니다. 홍수진: 시술 시간이 길어지면 edema가 심해지는 등 시술에 불리한 일이 많이 발생할 수 있습니다. Muscle에 가깝게 tunelling이 되어야 혈관을 덜 만나게 되고, preemtive coagulation을 할 때에도 근육 방향으로 접근해서 시행하여야 mucosal thermal injury를 피할 수 있습니다. 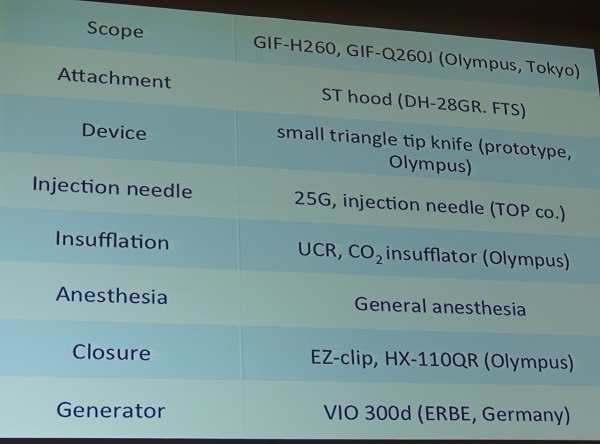 Intraoperative EndoFlip을 routine으로 하고 있습니다. Myotomy가 부족하거나 과도하지 않았는지 평가할 수 있기 때문입니다. 김경오: submucosal tunneling을 할 때에는 muscle에 가깝게 접근하여 시술하는 것이 좋습니다. 혈관을 preemptive coagulation할 때 주의하지 않으면 점막의 thermal injury가 발생할 수 있습니다. Body에서는 selective myotomy를 하는데 full myotomy가 되지 않도록 약간 superficial하게 절제하고 EG junction 부위에서는 circumferential muscle myotomy를 다 해 보면 longitudinal muscle이 워낙 얇기 때문에 저절로 full myotomy가 됩니다. Incision을 closure 해 줄 때 첫 clip을 잘 잡아주여야 합니다. 정현수: TT knife, Spray coagulation, effect 2, 60 watt를 사용하고 있습니다. Spray coagulation은 non-contact 방법이며, 표면적이 넓을수록 효과적이므로 TT knife가 유용합니다. 아산병원 김도훈 선생님은 IT nano를 사용하고 있는데, 끝에 tip이 있어 조금 과감히 움직일 수 있으므로 조금 빠르게 진행할 수 있습니다. Achalasia는 만성질환이고 증상이 다소 모호하여 의심하지 않으면 진단하기 어렵습니다. 숨어있는 환자가 있습니다. 그래서 학술모임 등을 통하여 achalasia에 대한 인지도가 높아지면서 점점 많은 achalasia 환자가 발견되고 있습니다. 그렇더라도 워낙 incidence가 낮은 병이므로 위암처럼 환자 수가 아주 많은 것이 아닙니다. 게다가 POEM 등을 통하여 효과적으로 치료될 수 있으므로 완치가 가능합니다. 일본에서도 achalasia 증례가 많이 발견되고 POEM으로 치료된 후 최근들어 새로 진단되는 증례가 감소하고 있다고 합니다. 매년 새로 발생하는 achalasia가 많지 않기 때문에 숨어있는 환자들을 발굴하여 모두 치료하면 신환이 줄어들 수 밖에 없는 구조입니다. POEM은 비교적 복잡한 시술이므로 learning curve 이슈도 있지만, 실력을 유지하기 위해서는 매년 일정 수 이상의 시술을 해야 한다는 점도 고려되어야 할 것입니다. 우리나라에는 achalasia 환자가 적으므로 POEM 시술자도 몇 명이면 충분합니다. 치료내시경에 관심있는 의사가 경험 차원에서 소수의 POEM을 시술하는 것은 좋은 일이 아닙니다. 몇개의 center에 집중하는 것이 필요합니다. 큰 병원일 필요는 없습니다. 작은 병원이라도 POEM 시술에 관심많은 시술자가 환자를 모아서 멋진 center를 만들면 됩니다. 일년에 한두명 시술할 것이면 아예 시작하지 않는 것이 좋겠다는 것이 제 의견입니다. 그래서 저는 POEM 시술을 하지 않고 있습니다. 본 병원에서는 민양원 교수님이 모든 시술을 하고 계십니다. 이준행 교수님 의견이 타당하다고 생각합니다. 환자도 많지 않은데 몇몇 center로 집중하는 것이 좋겠습니다. 그러나 모든 achalasia 환자를 의뢰할 필요가 있을 것 같지는 않습니다. 김경오 교수님 강의에서 소개된 Digestion지 논문(Digestion 2017;95:29-35)과 같이 type II는 쉽고 간단한 balloon dilatation으로 치료하고, POEM이 꼭 필요한 환자만 POEM center로 의뢰하는 전략이 유용할 것 같습니다. Showa 대학에서는 2008년 9월 8일 첫 시술 후 2018년 2월 15일까지 1621예의 시술을 했다고 합니다. 작년 IDEN에서 보여주어 큰 감동을 주었던 그 사진을 다시 보여주었습니다. 세계 최초 POEM 환자의 시술 8년 후 모습. POEM 시술 전에 비하여 체중이 20kg이 늘었다고 합니다. 2008년 9월 8일부터 2017년까지 일본에서 POEM이 2,998예 시술되었습니다. Major center는 Showa 대학 (1515예, 50.5%), Fukuoka 대학 (249예), Kobe 대학 (182예), Nagasaki 대학 (139예)였습니다. Inoue 선생님은 double scope method를 이용하여 LES의 distal margin을 확인함으로써 incomplete mytomy를 피하는 방법을 자세히 설명하였습니다. 내시경 fundoplication 방법도 소개되었습니다. 이름은 POEF (anterior partial fundoplication)였는데 내시경으로 peritoneal space에 들어간 후 clip과 endoloop를 이용하여 anterior partial wrap을 만드는 방법이었습니다. POEM을 하면서 POEF를 동시에 시행(POEM + Fundoplication)하면 시술 후 역류가 적다고 합니다. DeMeester score에 있어서 통계적 유의성을 보일 수 있다고 합니다. POEM을 하여 왕창 넓혀준 후 endoscopic fundoplication을 하여 약간 좁혀주면 역류가 적다는 것인데... 말하자면 병주고 약주고인데... 이렇게까지 할 필요가 있을까 싶었습니다. Endotoday를 통해 항상 많은것을 배우는 애독자 1인입니다. Achalasia에 대한 POEM치료는 이론적 배경이나 효과적인 측면에서 참으로 매력적인 치료방법인 것 같습니다. 저희 병원에서도 새로운 치료방법으로 시도해 보려 setting 중입니다. 몇가지 실제적인 면에 대한 교수님의 의견을 부탁합니다. 1. POEM은 결국 전신마취하에서 시행하는것이 안전할 듯 합니다. 실제로 고령의 achalasia환자에서 전신마취를 시행하는것이 기존의 의식하 진정의 내시경에 비해 morbidity에 차이가 없을까요. 2. 수가를 어떻게 책정하는 것이 좋을까요. 제가 알기로는 아직 POEM은 인정비급여로도 수가를 받을 수 없습니다. 혹시 여기에 대해 다른 교수님들은 어떻게 대처하고 계신지요. 새로운 치료방법을 시도함에 있어 수가체계가 가장 중요한 장애물이 되는 현실이 답답합니다. POEM을 많이 하시는 교수님께 문의하여 아래와 같은 답변을 받았습니다. "고령 환자에서 전신마취의 위험은 없을 수 없습니다. 그러나 일반적인 외과 수술을 받는 고령 환자의 전신마취 위험성보다 높을 것으로 보지는 않습니다. 더 중요한 문제는 심폐합병증입니다. 시술의 특성상 정도의 차이는 있지만 minimal mediastinitis가 유발될 수 밖에 없고, 시술 후 통증으로 인한 객담배출 등이 원할하지 않아서 이로 인한 2차적인 심폐합병증이 발생할 가능성이 있습니다. 동반 질환에 의한 문제를 사전에 고려하고, 마취과 선생님과 상의하여 위험도를 판단해야 하겠습니다. 이번에 신의료기술에서 또 탈락이 되었기 때문에 당분간 - 얼마나 걸릴지 알 수 없지만 - 합당한 수가를 받을 수 없는 상태입니다. 대부분의 병원들이 내시경 풍선 확장술 등에 준용하여 수가를 받고 있습니다. 사용되는 주 재료에 대한 문제도 해결되지 않았습니다. 학회에서 이렇게 활발하게 관심을 보이고 있는데도, 이 문제가 해결될 기미가 보이지 않아 안타까운 일입니다. 제가 다시 요약해보면, POEM은 전신마취하에서 하는 것이 좋겠습니다. 아직 코드는 없어서 balloon dilatation 코드로 시행하고 계신 교수님들이 많은 것 같습니다. 우리나라에서 새로운 시술을 도입하는 것은 매우 어려운 일이 되어 버렸습니다. 의사들이 적절한 수준의 융통성을 발휘할 수 있어야 환자에게 최선,최신의 치료를 제공할 수 있습니다. 그런데 이게 불가능합니다. 환자가 원해도 불가능합니다. 규정에 없는 것은 불법이라고 간주되기 때문입니다. 신의료기술로 인정을 받아야만 시술할 수 있는 것이 현재의 규정이니까요...... 한심한 일입니다. 상호간의 신뢰가 너무 낮은 것이 문제일까요? 규정을 잘 따르면서 최선의 치료를 하기란 매우 어렵습니다. 규정에 따라 오래된 전통적인 치료, 간혹 후진 치료만 할 수 있는 것이 우리나라의 현실입니다. 개별 의사가 법적인 risk를 떠안는 경우에만 첨단 치료를 할 수 있다는 것이 말이나 됩니까? 그러나 많은 분들이 그렇게 하고 있습니다. 환자를 위하여 기꺼이 위험을 감수하는 여러 교수님들을 존경합니다. 최근 정책당국의 회의에서 POEM이 통과되었다고 합니다. 조만간 보험 급여로 적법하게 시술할 수 있게 될 것 같습니다.